My last blog ended at the 1890’s, a time seen globally as a ‘golden age of discovery’. Many things were invented during this time which we still use today such as cinematography, escalators, x-rays, wireless radio, hydro electric power and electric underground trains. As well as being an exciting time for technological development in general, it was also a ‘age of discovery for the bicycle! ‘We believe that the only way you can learn about and appreciate the environment is by getting outside, experiencing it…and having some fun. The FSC Kids Fund provides financial support for groups of disadvantaged young people who would like to visit one of our centres for an FSC experience. FSC Kids Fund courses are funded by donations – from FSC members, FSC staff and support from Trust Funds. Build your own indoor mini greenhouse – looks like a job for someone beyond basic skill level! I write this month about lots of gardening related activity, but not so much ‘direct action’ in Old School Garden. The past few weeks have remained relatively mild here in Norfolk, only the slightest of frosts having affected us to date. I think this weather has been one of the reasons I’ve felt able to leave off doing some of the garden jobs I might have gotten on with in other years; leaf raking, dahlia digging, plant moving, bulb planting etc. Even though the greenhouse is more or less set up for winter with its bubble wrap insulation and electric heater, I haven’t yet hooked the latter up and certainly haven’t felt the need to get it going. 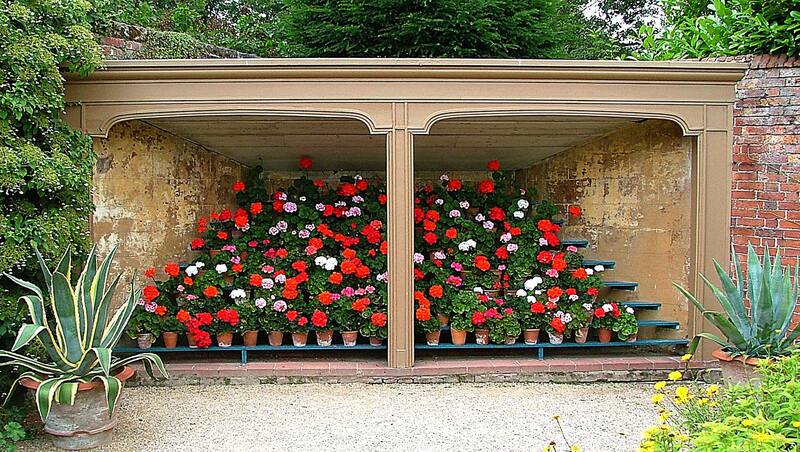 The greenhouse now has our Pelargonums, Echeveria and tender pot plants all set out for their winter repose. You remember the border of old English Lavender as you come into our drive? Well, I decided this has now got to be so ‘leggy’ and large that it was time to take it out and go for something fresh. I’m experimenting a little here, as I’ve transplanted a few Sedum plants (some of a spectabile variety I salvaged from Peckover House, whilst working there), and these are fronted by some divided Nepeta (‘Catmint’) to mirror a similar edge on the other side of the drive. I’ve spread the Sedum around a bit and inter planted them with the four packs of tulip bulbs I bought in Amsterdam recently. My hope, then is that the white, violet and blue heads of these will give a good spring show and once these are over I’ll put in some annuals to complement the violet flowers and glaucous foliage of the Nepeta- possibly some Californian Poppies as their shades of orange and red will give a real burst of interest in high summer. I migth also add some grasses (Stipa tennuissima for instance), and some Nerine bulbs that could do with replanting. These should both work well with the Sedums for some late Autumn colour and interest. I’ll post some photos of this border as the season progresses so that you can see how the plan works out in practice! Today looks like good plant moving weather, so I think I’ll try to tackle another area at the front of the house, by moving some Perovskia (Russian Sage) to a more suitable location fronting our big laurel hedge (and with some further Sedums in front to help this rather lax performer stay upright), and possibly plant the remaining 40 bulbs we got from Holland, along with some more Sedum (‘Herbstfreude’) to the front of the house. Completing the courses I’ve been running on ‘Grow Your Own Food’ and ‘Garden Design’, both of which seem to have gone down well with the participants. I hope to be running further courses in the New Year. Doing a ‘mystery shopper’ inspection of a Country Park near here as part of the ‘Green Flag’ scheme. Very satisfying reports on how some of the money raised at the opening of Old School Garden back in July has been used to fund food growing projects in Norfolk under the ‘Master Gardener’ programme. Come to think of it, I haven’t said much of late about my voluntary efforts at the local primary school and Gressenhall Farm and Workhouse. We’ve had some very productive sessions at the school, with children planting three apple trees in the orchard , weeding and digging over the soil in preparation for next year, sowing broad beans, onion sets, garlic bulbs and some green manure (the latter doesn’t seem to have germinated, probably down to the age of the seed). I’ve been heartened by the children’s enthusiasm for gardening, and I’m getting to know some of the real characters at the school- it’s always a joy to be greeted so enthusuastically when I arrive at the school! At the recent ‘open day’ one parent commented on how excited her child was when he brought home a runner bean seed in all its wonderful purply violet colours and one pupil who had sown some broad bean seeds in paper pots at this event, proudly presented me with one plant as ‘an early Christmas present’! A couple of ‘Garden Gang’ events have also resulted in the garden being tidied up, more progress being made on our plastic bottle greenhouse and the plumbing in of water butts from the garden shed to help with water supply. Parents are regular helpers at these sessions. I’ve also had a sort through the school’s seed collection. This was an interesting exercise, there being many packets (and several of these unopened) dating from 3 or more years ago. I’m tempted to give some these a go next year, though there are many packets where I suspect the seed is just too old to bother with. Here’s a useful article about using old seeds. Can you use old seeds? At Gressenhall Museum the gardens are slowly fading into dormancy and time has been largely spent here managing the decline to keep the borders presentable, planting up some new entrance barrels with bulbs and pansies for spring interest, as well as helping with other routine tasks such as raking out leaves and excess plants from the wildlife pond, weeding, and mulching the extended front entrance border with compost to help improve a rather poor soil. I think I’ll put in one more session here to complete the tidy up and them things can be left until the spring. Well, Walter, that’s about the sum of my efforts over the last month, and you’ll probably award me only 5 out of 10 for what I’ve actually done in Old School Garden! Hopefully today I can make inroads to the remaining jobs and then spend some time working out my priorities for the next couple of months. I know this list will include reorganising the outside sheds, installing a barrier made out of pallets to support the border in which my fan – trained cherry and plum are starting to get established and ordering seeds for next year. The latter will involve paring down the current list from my excited first look at the catalogues! I must remember to check the seeds I already have, including some purchased on the trip to Ryton Gardens a few weeks ago. I was pleased to hear that you’ve more or less managed to get your autumn garden tasks done, especially as you’ve had a few more frosty days than us. What are your plans for Christmas? Is there a chance that you could both drop in to see us for a weekend before the festivities really kick off? We’d love to see you both!